In our previous recent posts, we’ve taken a look into the world of carnival food. We will be honest about our experience looking into carnival food from around the world and at home. There are a lot of traditions and carnivals, and food that goes along with each – many more than we realized. It’s not that we underestimated the breadth of the topic necessarily, but more that we were just intending on talking about some classic American carnival foods (because we serve a good deal of them, like kettle corn, caramel apples, cotton candy, etc.) and ended up becoming really interested in what the rest of the world is doing when it comes to seasonal celebrations! That said, many of the “carnival” celebrations we have already highlighted don’t have too much in common with our nation’s reason for autumnal celebration. Many of the carnivals highlighted have to do with holy week, a Catholic tradition, or have a different reason altogether. But since when do you need it to be fall, the USA, or even need there to be a pumpkin festival to have a reason for celebrating? For us at Bengtson’s Pumpkin Farm, you don’t have to have a pumpkin patch to enjoy all that the fall season has in store for you, although it certainly helps get you in the spirit of things. At our near Chicago pumpkin farm, we’ve got all the classic American carnival foods you could ever want, plus a few more that might surprise you. Our Fresh Apple Cider Doughnuts are one example of such a delightful surprise. It’s one of our 2017 pumpkin festival’s “must haves”, and you can even get them to-go, if you like them enough! We would be surprised if you didn’t, so don’t forget to try some when you make your way to Bengtson’s Pumpkin Farm this year. And while we are talking about our food and drink offerings at our “pumpkin festival near me”, as you might have searched for us online, we want to briefly talk about our awesome lineup of food trucks. Now that we’ve described a few of the carnival-style treats (or at least, really good food) that you can expect here in our Homer Glen pumpkin patch, let’s move along to the meat and potatoes of today’s post. Keep reading if you are interested in hearing some fun, and sometimes wacky carnival foods from America and other parts of the world! As we mentioned above, many of the most common and formal carnivals from around the world occur on holy week, which is sometimes in the spring. And while many cultures use carnivals as an opportunity to indulge before a sacrificial period known as lent, many Argentinians are already in full sacrificial swing, having begun their meat-free diet. Most of of the food eaten at this time is either fish stews (apparently that doesn’t count as meat) corn, or tiny little sandwiches known as bocaditos! We need to talk about what Sweden does for Fat Tuesday, because the description and pictures look amazing. Their Fat Tuesday, Fettisdagen, is the only day of the year when you are officially permitted to eat a delicacy of theirs, Semla. Semla is a whipped cream sandwich, made with a marzipan mixture, whipped cream, and sweet bread buns. That sounds simple and wonderful. Looks like we will be needing to send someone over to Sweden for the next Fettisdagen so they can buy enough for the whole crew here at Bengtson’s Pumpkin Festival! If you are looking for some carnival food with a little caribbean flavor to it, we would recommend looking into what Trinidad and Tobago have going on. The variety of cultures and their influence might be the best thing of all about what Trinidad and Tobago have to offer in regards to pre-Lenten food. Their influences range from origin, including Africa, India, England, Spain, France, and more! That’s either a recipe for a disaster (too many cooks in the kitchen) or a blend of something beautiful. Our guess is that it’s the latter, with their traditional street foods creating a marriage of many of these cuisines. Roti, a West Indian flatbread, can be found at most any carnival, along with curried chicken or goat and fried bread sandwiches filled with chickpeas. This is getting us too hungry to carry on writing about it, so we should probably stop there. Trinidad and Tobago sounds amazing, especially if you are interested in something off the beaten path. Before we turn our attention back within our own borders, the last country we would like to put on our wish list of places to try out carnival food would have to be Belgium. Why Belgium? That’s an easy one, they love sweet food as much as we do! Their fruit-stuffed, deep-fried doughnuts are made right on the street, and come with a generous portion of powdered sugar over the top of it to leave no doubt whatsoever. Find a couple at any street-stall in the town of Binche during their pre-Lenten festivals. 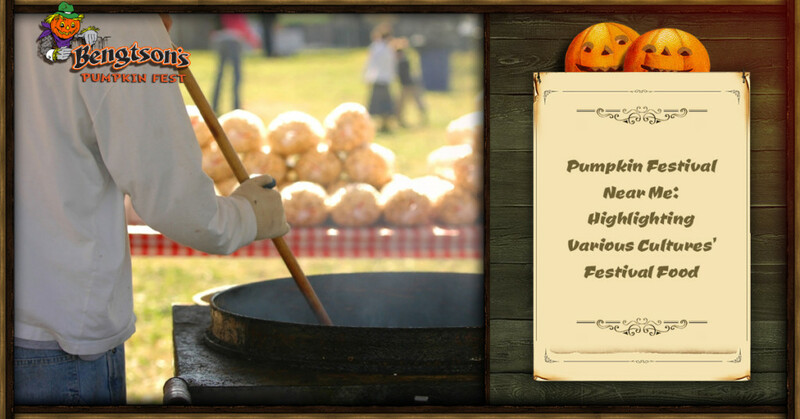 You might just see a few of us from Bengtson’s Pumpkin Patch, because we need to try these as soon as possible. Let’s move on from this cross-cultural discussion of deliciousness to discuss some weirdly interesting American carnival food attempts. We aren’t sure about the success of some of these, but they are certainly worth mentioning in a post about carnival food! For the record, most of them are deep fried, as you may have already been able to guess. Let’s start off with a bang, shall we? You might be familiar with deep-fried cookies, but the obsession with deep-fried everything has now hit new heights. But how can you deep-fry something that’s just liquid? That’s a silly question, because they simply take the Kool-Aid powder and roll them up with flour and water. Then just pop those balls into the deep-fryer for a bit, and you’ve got yourself an unhealthy, and likely delectable treat. Yeah, we’d try those. Speaking of deep-frying out of the ordinary foods, the 2009 Texas State Fair introduced deep-fried butter. In addition to the original butter flavor (for butter-flavor purists, no doubt), they also added grape and cherry flavors. While it’s probably not something we’d like to include as a side dish for every meal, who are we kidding? Those sound delicious. Perhaps more accurately described as beer ravioli, beer is packed in dough upon being fried. Then it’s topped with nacho cheese to seal the deal. This one might be worth a shot, but of all the dishes we’ve discussed so far, this one might have the greatest chance of being a dud. Alright, it’s time to diversify, at least slightly. With all of the deep-fried everything going on, you are going to need some carnival food that can cut through the fried dough, right? Kansas State attempts to do so, we presume, with their salty take on popsicles. Basically, it’s frozen, sour pickle juice. So while the acidity of the treat might do some good, we can’t imagine trying anything more than a quick nibble. No thank you bites are polite in every culture, as everyone knows. You may have been searching for a pumpkin fest near the Chicago area with a query like “pumpkin fest near me”. In fact, that may be why you’ve made it to this page right here. You might not have known you were getting into a post about the world’s variety of festival foods, but nevertheless, here we are. Now that you’re here, we’d like to point you towards more information about our Hours and Rates. Time is running out on this season, as we are well and truly into October now. It’s our biggest expansion in our entire 37 year history. With 8 Unlimited Rides available everyday, free parking, free admission for children 2 and younger, and and tons of delicious carnival food, it’s a great option the entire family can enjoy. Stop by Bengtson’s Pumpkin Festival today!